Verdure Aux Oiseaux II - Horizontal shows a work based on the original from Oudenaarde at the 18th century. Now in the Royal Museum in Brussels, this work is an example of the works produced by the famous region specializing in tapestry production. In this garden here we see storks and parrots enjoying the countryside scene which is next to column ruins. The details in the tree foliage is beautiful as are the plants in the foreground. The blue greens of the river provides a color relief against the warmer browns, and olives. 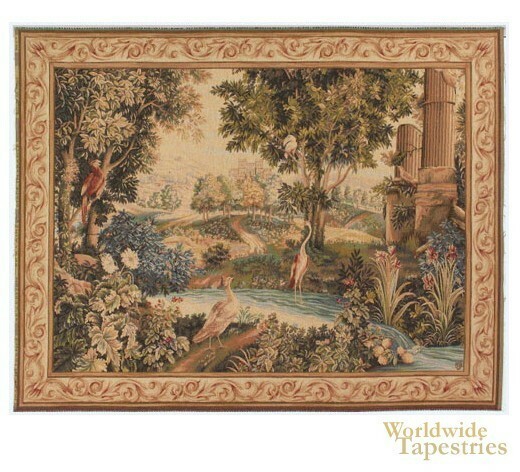 This Verdure Aux Oiseaux II - Horizontal tapestry is backed with lining and tunnel for easy hanging. Dimensions: W 78" x H 48"